The accreditation standards in law enforcement assure the citizens that the police department meets specific criteria of public safety services which have been set forth by national and state Commissions. The Marlboro Police Department is a professional organization which strives to attract, process and hire the most qualified personnel, and has taken on the challenge of accreditation with The New Jersey State Association of Chiefs of Police (NJSACOP) to ensure our service continues to excel. Sgt. 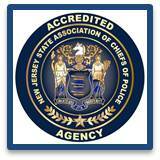 Darren Vuzzo spearheaded the accreditation process and NJSACOP State Accreditation was obtained by the police department on March 20, 2014. Sgt. Allan Bilinski will take over the accreditation process in September of 2014 upon Sgt. Vuzzo's retirement. The accreditation process is designed to increase citizen and employee confidence in the agency by establishing objectives, goals, policies, and practices. These directives are continually reviewed to ensure that we maintain current law and procedural changes. This process further emphasizes a self-assessment component to ensure adherence throughout the department. Controlled liability insurance costs to the police department and lower premiums. Greater efficiency in meeting the needs of service to the community. Greater accountability by written directives that clearly define lines of authority, decision making and resource allocation. Increased accountability and policy standards assist in stronger defense against lawsuits and citizen complaints. Frivolous legal actions against the police are shown to decrease with accreditation. One of the most important benefits in accreditation is the recognition of excellence which reflects on the dedication of the department towards its citizens. If you have any questions regarding the accreditation process, please contact the Accreditation Manager .